Talks between Valletta and Birkirkara over a player-exchange deal involving goalkeeper Henry Bonello and midfielder Rowen Muscat were concluded late yesterday evening as the two big guns finally reached agreement on the terms of the transaction. The possibility of two high-profile Malta internationals switching from one rival club to another has dominated the local football news in the opening week of the January transfer window. The sight of Bonello watching Birkirkara’s 2-0 BOV Premier League win over Mosta on Wednesday fuelled speculation of an imminent switch to the Stripes for the 28-year-old goalkeeper. Muscat also saw the game from the VIP zone of the Victor Tedesco Stadium after being left out of the Birkirkara squad. The Malta midfielder yesterday morning agreed personal terms with Valletta following a lengthy meeting with club officials, led by president Victor Sciriha, but was unable to report for training with the champions as talks between the two clubs were still in progress at the time. It was around 7pm yesterday when discussions between the two clubs finally reached a successful conclusion. Bonello had also agreed in principle to continue his career with Birkirkara who have made the acquisition of a Maltese goalkeeper their top priority this month. With beleaguered Croatian goalkeeper Miroslav Kopric suspended by Birkirkara and unlikely to play again for the club, Ini Etim Akpan guarded the team’s goal in their 2-0 defeat of Mosta. For his part, Muscat has endured a stop-start season so far with the talented midfielder struggling to hold down a regular berth in the Birkirkara team since returning from a short loan spell with Italian club Pavia who have since gone bankrupt. Having barely featured in Birkirkara’s march to the third qualifying round of the Europa League last summer, Muscat has been conspicuous by his absence in the team’s last three league outings. Valletta coach Paul Zammit rates Muscat very highly after working closely with the player during his two spells in charge of Birkirkara. 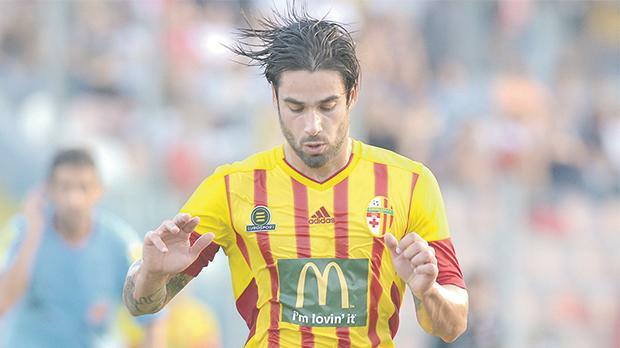 After Valletta’s initial overtures for Muscat were rebuffed by Birkirkara last summer, the champions’ prospects of securing his signature increased this week as the Stripes were very keen to take Bonello on board. The former Sliema Wanderers and Hibernians goalkeeper played a crucial role in Valletta’s title-winning campaign last season but his fortunes have taken a nosedive over the past two months as Lithuanian custodian Dziugas Bartkus has impressed since stepping in for Bonello during the latter’s three-match ban. Valletta have also opened talks with Bartkus to extend his contract which expires at the end of the season. Elsewhere, Luis Edison ‘Tarabai’ is unlikely to return to Hibs for the second half of the season as the Brazilian striker is on the verge of sealing a loan switch to a club in Saudi Arabia. Tarabai had been widely expected to rejoin Hibernians following the end of his second loan spell with South Korean club Seoul E-Land in November but the 31-year-old has since received an offer from the Middle East. Hibernians have theoretically agreed terms with the unidentified Saudi Arabia club who want to sign Tarabai on loan until the end of May. It is understood that Tarabai penned a new contract with Hibernians until 2020 before flying to Saudi Arabia to conclude talks with his suitors. Meanwhile, Ħamrun are interested in signing Manolito Micallef from Pembroke Athleta in exchange for striker Daren Falzon who had joined the Spartans on loan from Naxxar Lions in the close season. Strugglers Pembroke, level on nine points with Mosta at the bottom of the BOV Premier League standings, are also expected to hand a contract to two Greek players, a defender and a striker, who were due to join the team for training yesterday evening.